I’ve been a little absent of late but I’m back! Pheebz continues to eat. So read on…. 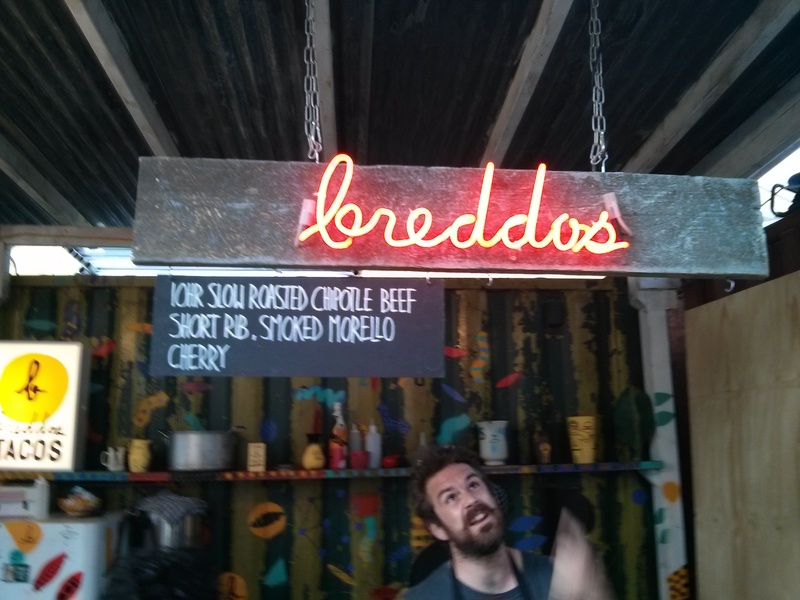 Back in May, Dalston became a foodie paradise with a purpose that extended beyond guzzling oneself silly. 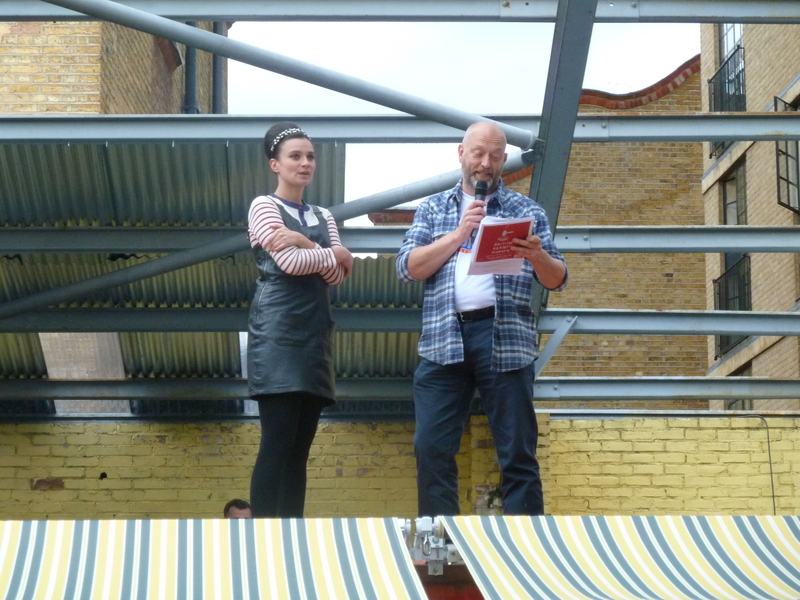 Charity Action Against Hunger teamed up with Street Feast to provide a gourmet evening hosted by Gizzi Erskine. However, there was a twist: amazing foodie experiences were available to be won by the highest bidder. Action Against Hunger were taking action indeed: this was Auction Against Hunger. We arrived early as it was just kicking off. Which was perfect for diving into the food! 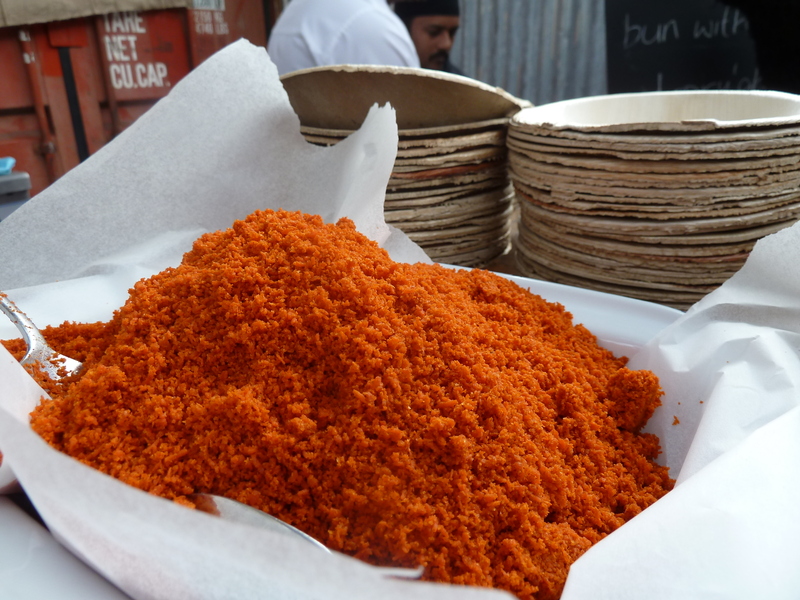 I was beside myself with excitement because not only was the event full of some of my favourite street food traders, but some really, really good restaurants were trading there. First up, Dishoom – famous for serving up Bombay street food as little sharing dishes (review here). 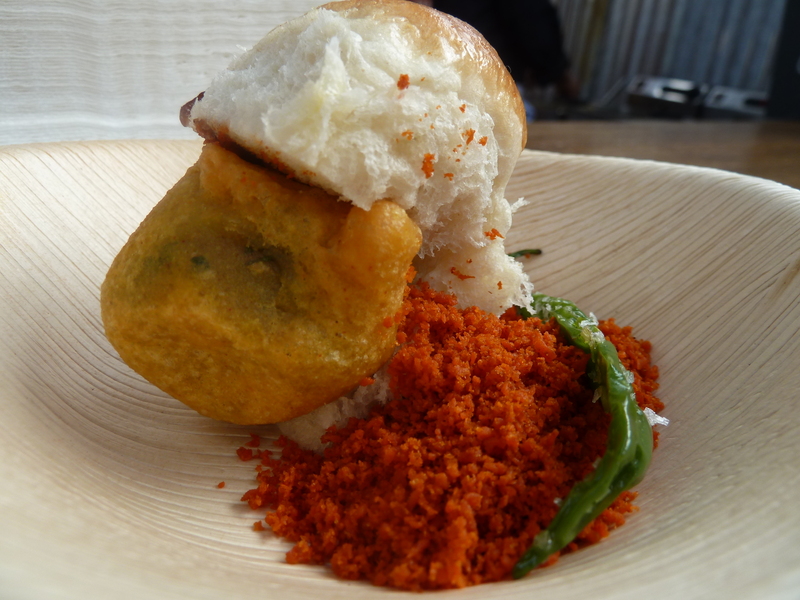 They were dishing up Vada Pau – the equivalent of an Indian chip butty. It’s a little spiced potato cake served with red Ghati masala and salted green chillies, which are surprisingly unbitter. One of my absolute priorities at Auction Against Hunger was to get myself a bit of Yum Bun. 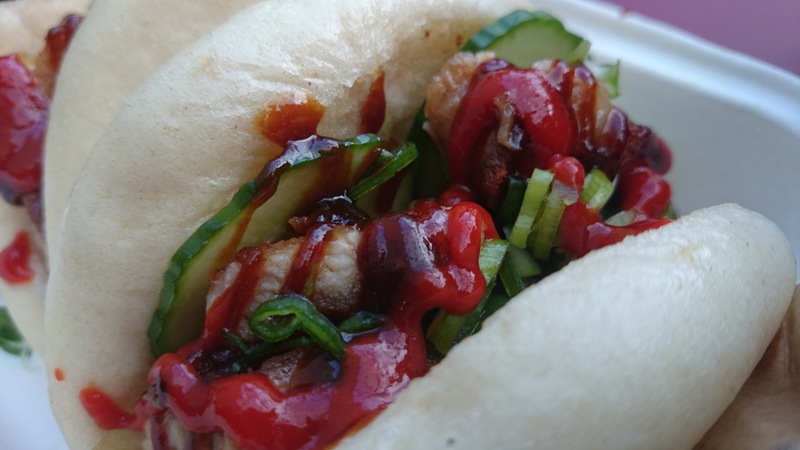 These ladies have taken the Taiwanese gua bao and done wonderful things by recreating it in the UK. 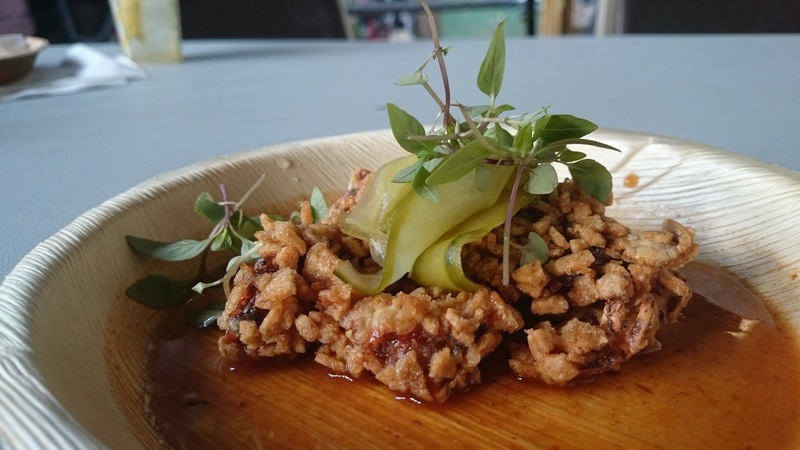 Tender pork belly with sriracha. There is always a huge queue for them and that’s because once you’ve had Yum Bun, you can never go back. One of the most memorable dishes was Pascal Aussignac’s (Club Gascon) Marmite Royal – a silky duck flan topped with Marmite sauce, served in a Marmite jar. I’m in the love camp and so I was delighted to find that duck flan went extremely well with it. Plus how often do you get to say….can I have some Marmite with my duck? 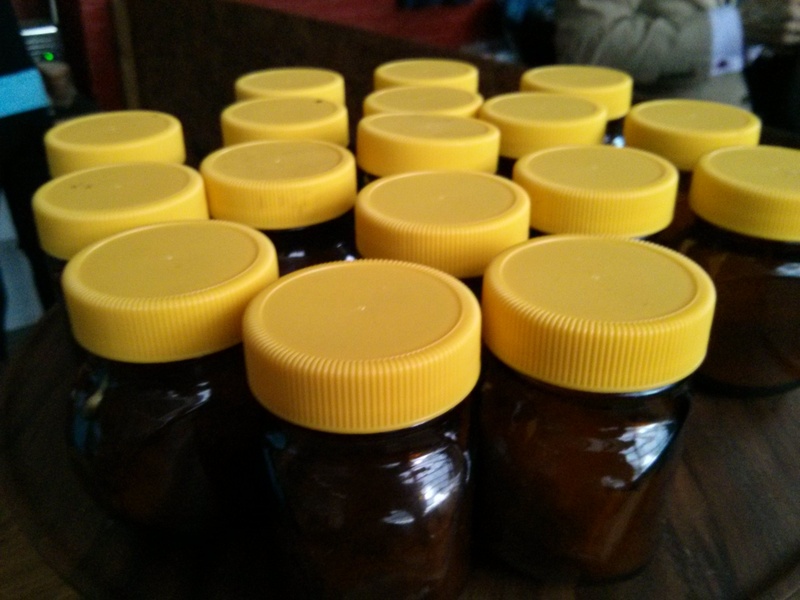 Marmite jars with duck inside – surprise! 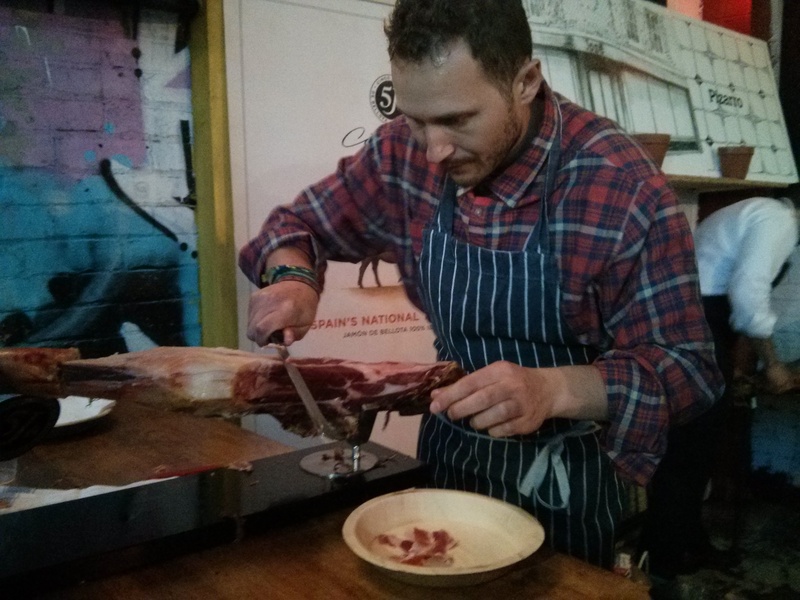 My absolute favourite dish was from Ben Tish of Salt Yard Group, which includes three modern tapas restaurants in London. On offer today was the Iberico Pork and Foie Gras burger, which is making me heavily salivate as I write this. 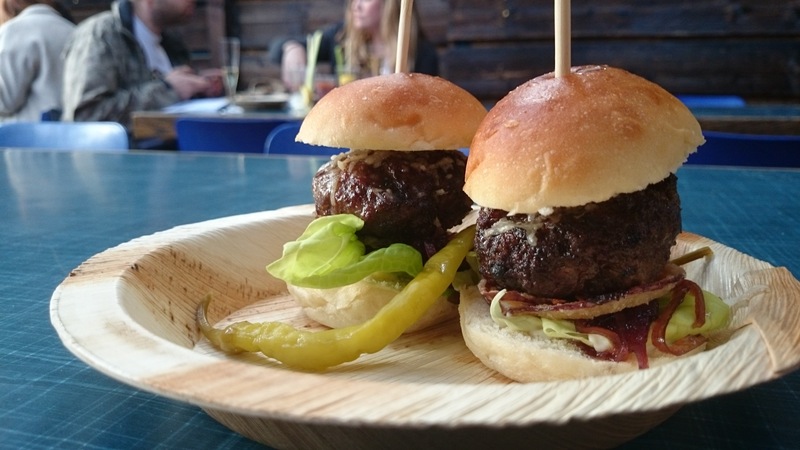 Pork and foie gras burger – they may look unassuming but they were the best thing at the event! Pudding was a really unusual concoction from Paul A Young. This shouldn’t be a surprise as this is the man who is famous for weird and wonderful chocolate fillings – I particularly love the Marmite truffle. Tonight there was a Brewdog 5am Saint and Peruvian Chocolate Ganache, roasted salted peanut truffle, chocolate-dipped Pitt Cue Co. and chocolate maple syrup. Not only did this feature one of the trendiest beer producers and one of the trendiest meat restaurants in town, it managed to combine alcohol, salty snacks and wrap it up into a chocolatey pot so successfully that only its richness prevented me from immediately rushing back for seconds. 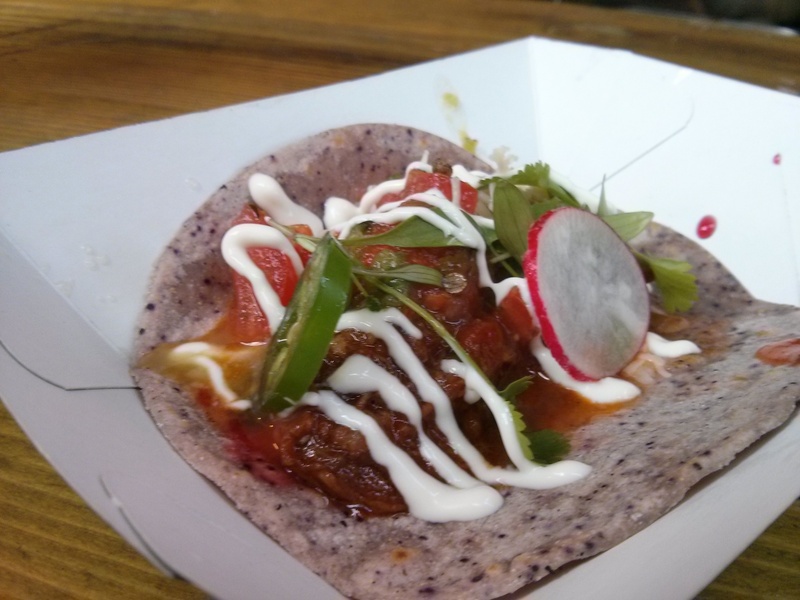 Have a look at what else was there…..
Modern Pantry – I’m a huge fan of their brunch. This crispy crab was sweet and crunchy but lacked complexity of flavour to make it truly interesting. 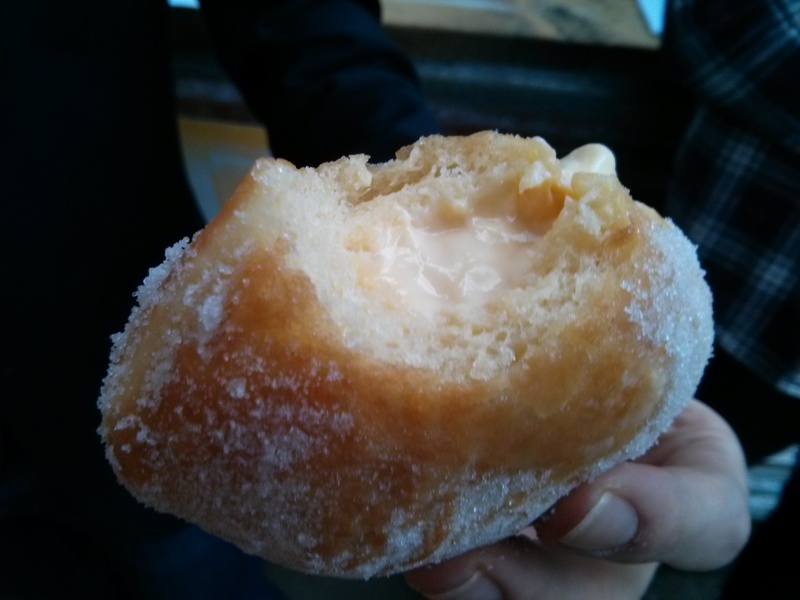 1235 Doughnuts – salted caramel. YUM. 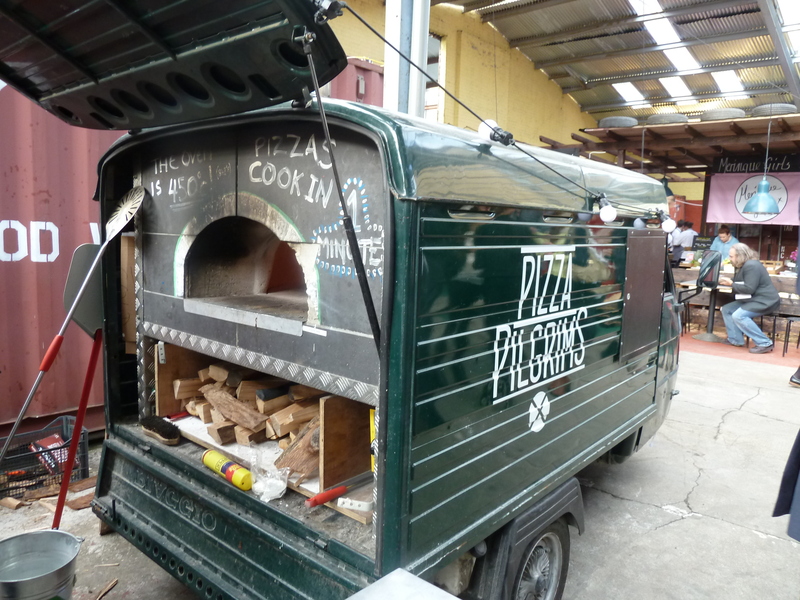 Pizza Pilgrims – I find it hard to get excited by pizza (don’t judge me) but these guys have made Italian friends of mine excited. Enough said. 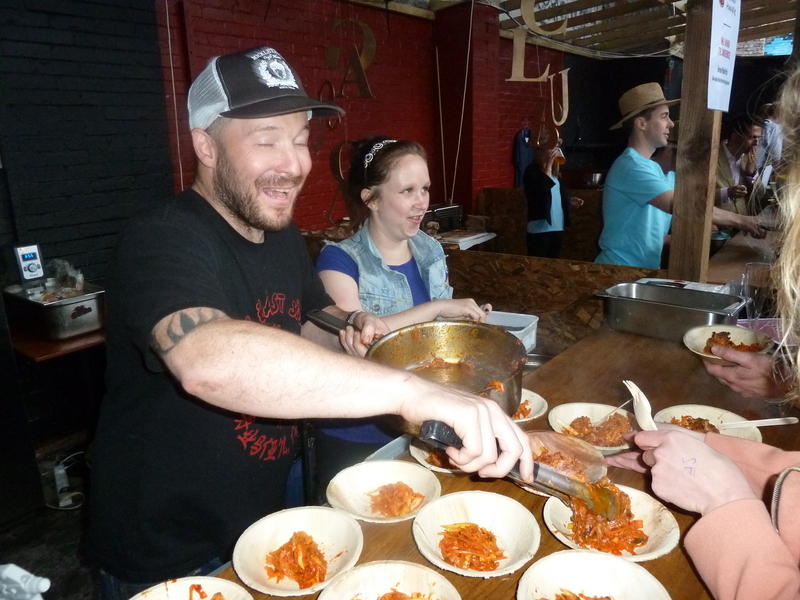 Neil Rankin – his dish was way too salty (we had to abandon it) but at least he looks very happy. This pic made me laugh. All worship the Breddos God. Of course, whilst the food was overwhelmingly plentiful and delicious, the evening was a charity auction. And the prizes on offer were simply amazing. 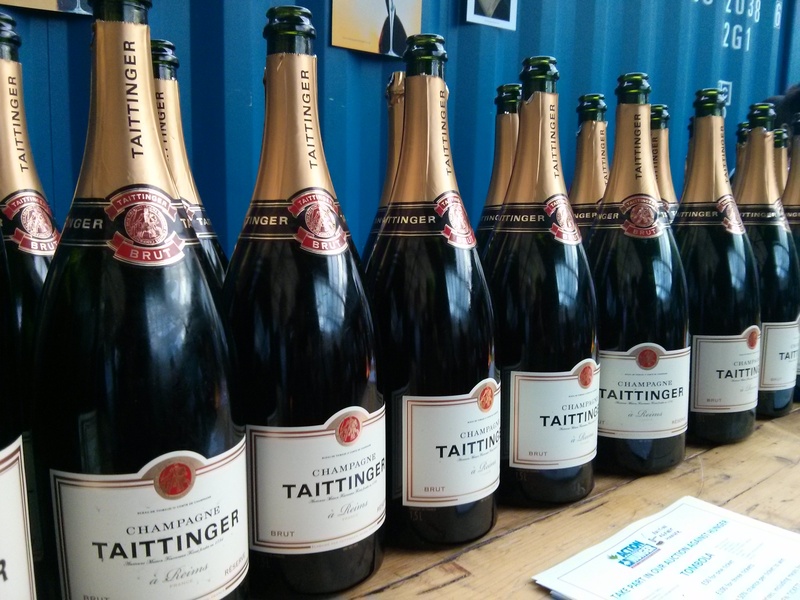 How would you fancy winning…. A private tour of Heston Blumenthal’s The Fat Duck? Dinner with Sir Terry Wogan at Merchant’s Tavern? Or how about a table for 20 at MeatMission with unlimited food & drink? 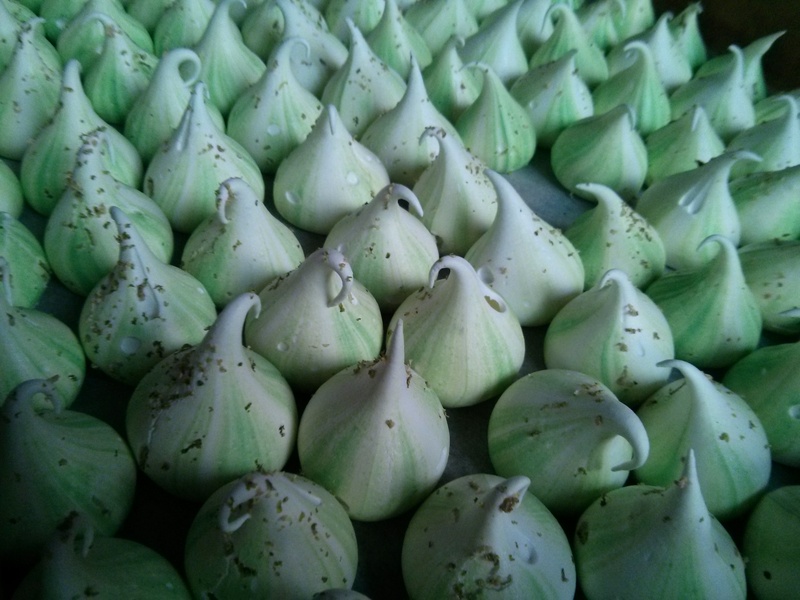 Personally, I had my eye on spending a day in the kitchen at Angela Hartnett’s Murano. I am such a fangirl of her restaurants – I have only dined at Limewood Hotel and Café Murano so far but both experiences were fantastic. Bidding began and wars broke out. Figures danced into the thousands. 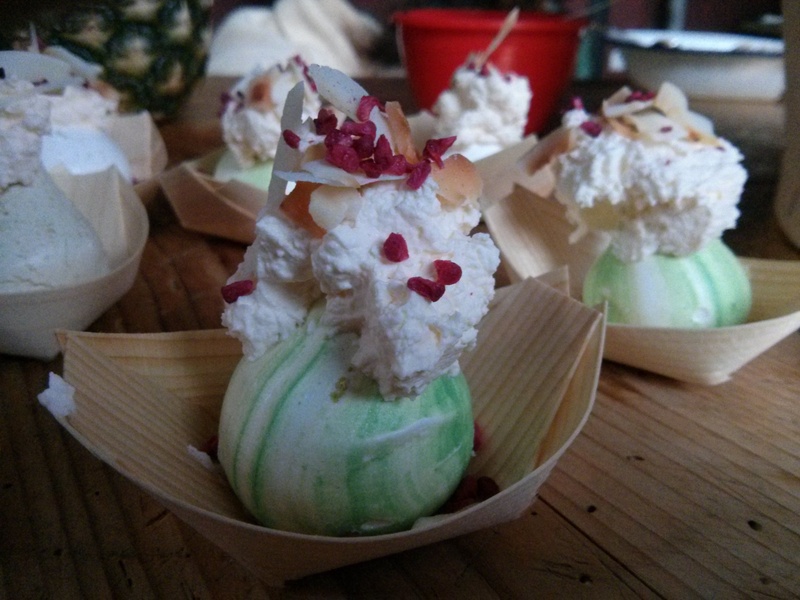 But the recipe was a success – the evening raised a staggering £105,089. Congratulations Action Against Hunger and Street Feast! And thanks to R and R for the invite! 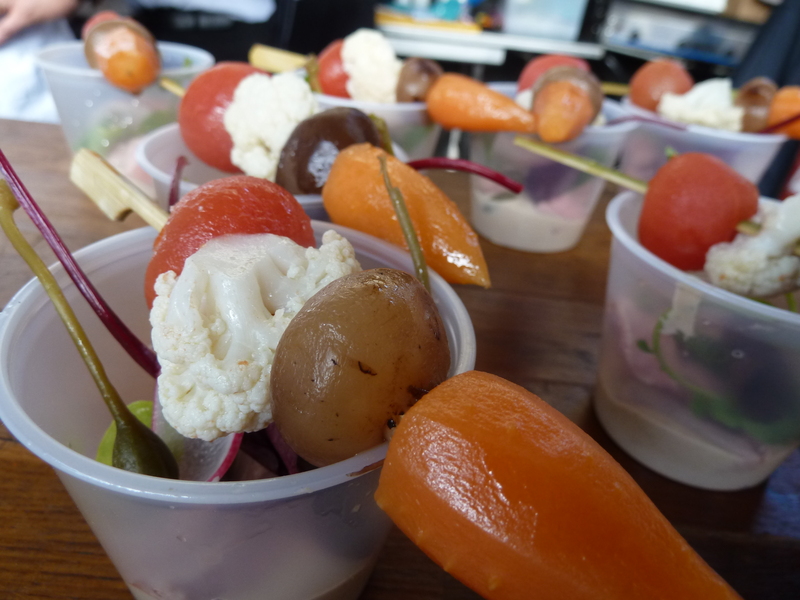 Coming soon – my adventures volunteering for Action Against Hunger at Taste of London festival.